Original, first-week engagements of "Star Wars"
The engagements on the list have been identified by market, or exchange as it is known in film distribution parlance. In some cases, the theatres are/were not located in the market city noted but, rather, in a suburb or neighboring city. For example, the Glenwood was located in the Kansas City, Missouri suburb of Overland Park, Kansas; the Rock Island Showcase Cinema was located in Milan, Illinois, a neighboring city of Rock Island and the so-called Quad-Cities; the Park (AKA the St. Louis Park) was in the Minneapolis suburb of St. Louis Park; the Americana was in Southfield rather than Detroit proper; the Showcase East in Pittsburgh was actually in Monroeville; and so on. Specific cities have been identified only in cases where a market had multiple engagements (Chicago, Los Angeles, New York, Philadelphia). 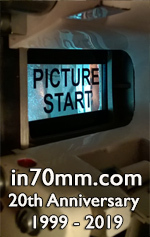 "Dolby"/"70mm-Dolby" = format indications represent opening-week presentation type. Engagements on list without any designation are believed to have been monaural. Many theatres upgraded their projection and/or sound systems during the course of run and switched to a different type of presentation.